Providing vouchers to every American so they can select their own health care and education services. Facilitating the establishment of independent collective bargaining organizations. 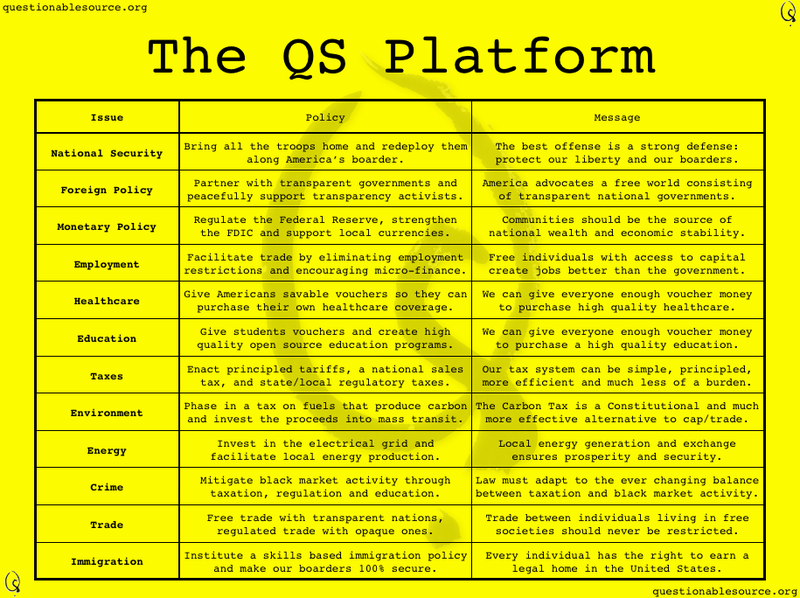 The goal of the QS Platform is to articulate a set of principles and policies that enable communities to solve their own problems through individual self-actualization. Networked information technologies enable people to organize solutions to the collective action problems that, in the past, could only be solved by government. The emergence of these technologies (ex. the internet, mobiles phones, GPS) allow humanity to create a compassion libertarian society that facilitate community solutions to local problems by expanding individual liberties. People are compelled to self-actualize by their own nature and by the marketplace. Only free individuals can approach self-actualization. People are happiest doing what they truly love. Through self-actualization, people evolve contributes to the their own personal evolution, the creates the most value possible for society. by their own nature to self-actualize. that a perfectly free market operates under the same rules that govern natural evolution. Like blowing wind or surging water, man-made structures can channel the natural force of the free market into unnatural arraignments that transform the liberation of voluntary exchange into a coercive relationship of dependency and oppression. This ‘channeled’ free market is the one critics of capitalism are familiar with, but these critics don’t realize that only government (only the people with guns) are capable of building structures that channel the forces of the market into inequitable arrangements. Our mission is to liberate the free market from these unnatural structures by creating a perfect marketplace that compels each individual to achieve his or her full potential. The New World was a void into which the most ambitious ideas of the Western Enlightenment could be applied without the baggage of European institutions. It was on American soil that immigrants came together and asked the simple question: how can we build the world’s greatest government? Despite their diverse philosophies, divergent economic interests and disparate geographic locations, the founding fathers came together around one issue: limiting government. America’s founders knew that government, like all institutions, loses focus on its initial mission and becomes increasingly concerned with it’s own survival and growth. Over the course of the last two centuries, the Federal Government has traveled the well worn path towards empire, growing steadily as it pressured Americans to exchange individual liberty for centralized power. This power has been used to make the Federal Government an integral part of everyday life: from business operation to education, health care to recreational choices. Unlike European nations, our government was never intended to provide for us. Indeed, the intention of our founding fathers was clearly to make sure government did not provide for us because, by doing so, it would make it impossible for us to provide for ourselves. Free people provide for themselves, but the Federal Government isn’t interested in freedom. After two centuries of expansion, it’s clear that the Federal Government wants us all to believe that the concept of liberty is as antiquated as the paper upon which our Constitution was written. Communities don’t have the right to coerce people with the threat of physical harm, but they do have the right to use the tools of social coercion. Indeed, it was the forces of compassion and social coercion that compelled individuals to organize and finance the many thousands of diverse philanthropic institutions (nonprofit, for-profit, religious) that provided countless Americans with health and education services before the income tax was established during World War One. The forces of compassion and social coercion have the strength to finance philanthropic health and education services superior to those run by the government, but the government, like any competitive organization, works to prevent competition from entering the market by levying high taxes on the people and creating complex regulations with high compliance costs. These tactics, and others, have successfully prevented private philanthropic services from competing with the government and allowed the government to continue to grow. While advancements in technology have made the dream of privately run universal health care and education attainable, the Federal programs continue to expand, preventing that dream from becoming a reality.